For all these options only prepayment is accepted. Upon receipt of the amount due, the order is prepared for shipment and sent off. The checkout page is protected by encryption. This is shown by the change of the HTTP in front of the link in the browser by HTTPS where the ‘S’ stands for ‘secure’..
For payments within the European payments area the normal EU Standard Bank Transfer (SEPA) is preferred. After the order is completed the customer will receive an automatically generated e-mail, in which the order, the amount to be paid and our IBAN and BIC are presented. Because of the meanwhile widely impelled networking of banks in the EU area, this kind of money transfer will be credited within a few days at the receiver’s account and does not cause any additional fees. Basically, any customer who has a paypal account can pay via the PayPal system. However, here, it is particularly offered to customers outside the Euro zone. PayPal payments are displayed within minutes at the Paypal account of the recipient, but it may take several days before the amount minus a fee from that paypal account is transferred to our bank account. 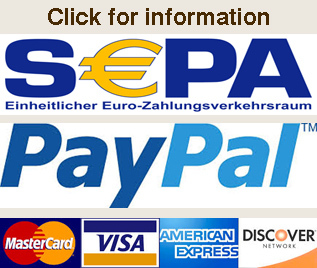 The major credit cards are supported. Basically, any customer who owns one of the supported credit cards can use it to pay the placed orders. However, here, this way of paying is particularly offered to customers outside the Euro zone. It takes about seven days before the amount minus a fee is credited at our bank account.